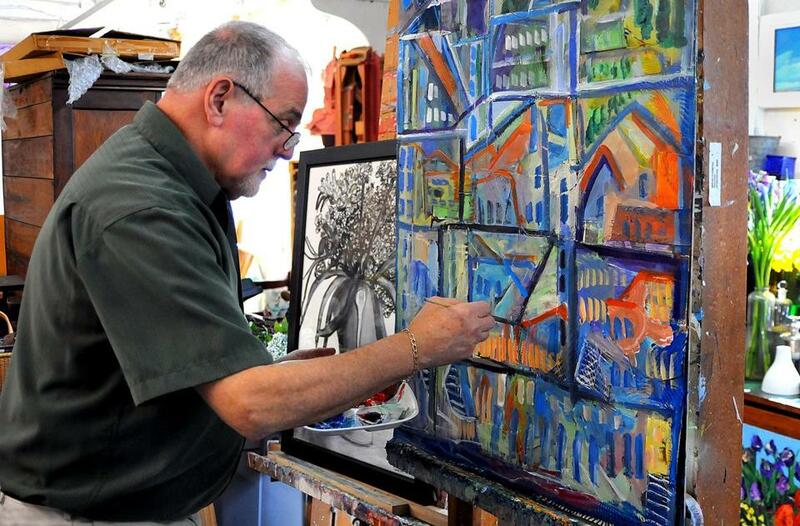 Paul Crimi of Pembroke works on a painting in his studio in Rockland. “My art is the best way to express my appreciation for the joy and happiness . . . in my life,” he says. Donning a paint-splotched smock, Paul Crimi raises a brush to a midnight black canvas, quickly covering it with white streaks that create faint silhouettes. Soon, blotches of green and yellow form trees; blue fills out the sky and a flowing river below. He continues with dabs — both generous and gentle — of red, orange, black, purple, moving up and down and around the landscape. Finally, in less than an hour, he has a mostly completed painting: An abstract rendering of the Indian Head River in Hanson, lush with reeds and fall foliage. You might call him the local Bob Ross. For decades, the prolific, energetic, 70-year-old Pembroke artist has hosted an area cable access show, “Expressions in Painting,” in which he introduces various concepts, techniques, and styles, and urges people to cultivate their inner artist. And while he’s become somewhat of a local celebrity over the years, he’s also now enjoying a bit of national fame: Recently, his shows have been sporadically picked up by stations in Philadelphia, California, Wisconsin, Illinois, Maine, New Hampshire — and even Alberta, Canada. “He actually talks to the viewer,” said Margaret Jones, president of the nonprofit Pembroke Community Media Center Inc., which produces the show. “A viewer can develop a personal relationship” with him. And unlike the beloved, curly haired Ross — famous for his “happy little trees” as host of the PBS program “The Joy of Painting” — Crimi doesn’t as explicitly lay out what, where, and how much. Sometimes, he said, he specifically refrains from identifying what colors he’s mixing or what brushes are layering those onto the canvas. “I want people to have their own identity,” he stressed. Instead, in his roughly hour-long show, he’ll paint — anything from foggy days in the woods, to vases of flowers, to Nantucket in the wintertime — impart some instruction and commentary, and ruminate on his family, his background, or his passionate spirituality. It’s an endearing approach for many. “He really brings his family, or whatever mood he’s feeling, or whatever’s going on with him, into the painting,” said Catherine Briggette, Pembroke Community Media’s executive director of marketing. Ted Bennett, one of his volunteer videographers, agreed: “I love his philosophy,” he said. Crimi averages about a show a month, or as Jones noted, “as the muses strike him.” They are filmed at his studio in Rockland and at local high schools, where students working on his crew earn community service credit hours. Once edited, the shows are available on the Pembroke Community Media website as well as YouTube, and are also offered through public, educational, and government access television. “Expressions in Painting” has aired regularly in Pembroke, Bridgewater, Marshfield, Hanover, Halifax, Plympton, Middleborough, Brockton, Danvers, Beverly, and Cambridge, Jones said. 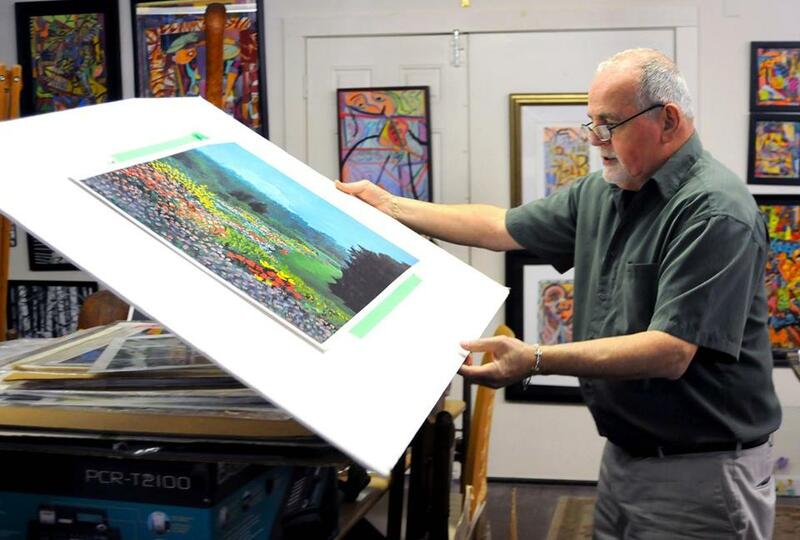 Paul Crimi goes through some of the hundreds of pieces in his Rockland studio. Anybody can be an artist, he emphasized; if you tell yourself you can’t — well, then, you won’t be able to. Later, he studied at the School of the Museum of Fine Arts in Boston, where he further honed his drawing, painting, and printmaking skills. But coming from a family of barbers (preceded by both his father and great-grandfather), he went into hairdressing as his full-time trade. Before retiring at age 63, he said he would wake up most mornings at 3 a.m. to get studio time in every day before heading to his parlor to handle clients. Likewise, he found ways to blend the two careers, using his parlors as galleries to show off and sometimes sell his art, and considering his customers his “living art.” In his studio, meanwhile, he has long used hairspray as a layering agent, and a professional blow-drier to expedite the painting process. There’s no doubt that, in his decades as an artist, he’s been prolific. He did one series of 137 on a particularly beckoning stand of birch trees; another series of 30 on the 23d Psalm; and more and more pieces continue to emerge from a 1997 trip to Italy, during which he says he snapped 2,500 photos (or roughly 100 rolls of film). 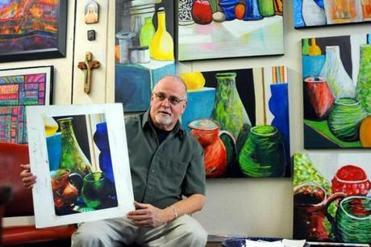 That passion is evident with a visit to his studio in a former mill building in Rockland. The walls are covered; tables and desks are overflowing. Look one way, and you see a series of seascapes — waves broiling over rocks, islands brooding just offshore, scavenging seagulls. Glance up and around to see decorated mirrors, crosses, dangling and standing sculptures — colorful, abstract, realistic. Scan from there, and you take in stands upon stands of birches, water-lilies, lupines in the woods, Italian street-scenes, colorful collages, and welcoming wooden paths — paintings and drawings on simple canvases, some framed, others propped neatly against or on top of each other, even more stacked in drawers. Vases sit crammed full of all sizes of brushes, tinged various hues from their recent forays with the canvas. An easel is dashed with splashes of every color imaginable — artistic battle wounds. View “Expressions in Painting with Paul Crimi” on www.pembrokecommunitymedia.com. Visit Crimi’s website at www.paulcrimifinearts.com.